Facebook Introduces Community Pages, Hopes To Make Them "Best Collections Of Shared Knowledge"
Today, Facebook is announcing the first in a string of product launches that we’ll be seeing this week. We just reported that the site is about to revamp its Interests section. And today it’s also launching a new type of profile called Community Pages, as well as some new privacy options. Facebook’s somewhat-ambiguously titled ‘Pages’ are what brands and celebrities use to establish a presence on the social network (they launched in their current form early last year). Facebook has been facing a problem, though, as users have created Facebook Pages around topics that are decidedly not brands, like baseball or yoga. Communities, which were first noticed earlier this month and are now launching, are Facebook’s answer to this problem. Facebook says that Community pages are meant to be “the best collection of shared knowledge on a topic”. When you visit a community page, the first thing you’ll see is an ‘Info’ tab that has a brief description gleaned from Wikipedia, followed by related posts that your friends and the global Facebook community have created (it looks like Facebook is running a search query on the topic and showing the results). There’s also a tab for ‘Wikipedia’, which contains the full entry if it’s available. 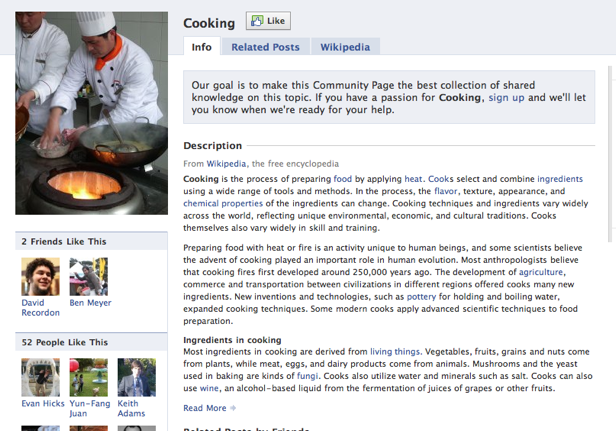 At launch Facebook has created over 6.5 million community pages, around topics like Cooking, Cycling, and Hiking. Conspicuously absent are options to actually add content to the page, aside from updating your status with a relevant keyword. There’s no Wall, and there’s no way to post photos or videos. Instead, Facebook is currently inviting users to apply to add content to these pages later on (it sounds like Facebook is still fleshing out how exactly this will work). Facebook intends to eventually allow users to upload their photos to the page. At this point, though, it seems like Communities have a long way to go before they feel anything like an actual community. Still, it’s clear that these could have a lot of potential in the future.